MVZ egg and nest specimens are catalogued separately from traditional specimens (skins, skeletons, fluids). The egg and nest collection contains over 14,000 items, including over 12,800 egg sets, 220 nests, and 900 egg-nest combinations. The size of this collection ranks it as one of the largest such collections in North America. 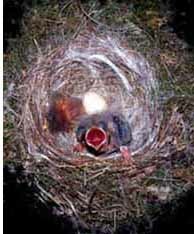 Eggs of nest parasites (e.g., cowbirds) are present in approximately 120 sets, and 150 egg sets or nests are associated with catalogued bird specimens. The earliest egg specimen was collected in 1843, with growth concentrated from the late 1800s to early-mid 1900s. Eggs in this collection represent all major orders of bird, and range in size from the tiny eggs of hummingbirds (0.2 grams) to the gigantic eggs of the extinct elephant bird (9 kilograms). Geographic representation is greatest for western North America, but there also are significant holdings from Europe, Asia, Africa, and most other continents. Approximately 80-90% of the specimens are accompanied by original collector data slips and by photographs taken in the museum, both of which are digitally linked to the record online. These data slips contain information on collecting locality, date, clutch size, incubation, identification, nest composition, and nest placement. Although the egg and nest collection receives less use by researchers than traditional specimens, it still provides an important resource for studies of geographic variation, breeding phenology, and contaminants. Perhaps the most significant use of the MVZ collection was in the study of pesticide effects (DDT and DDE) on eggshell formation. 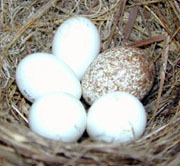 Researchers measured eggs collected before and after the introduction of these pesticides, in the MVZ and other collections, and showed conclusively that the pesticides were responsible for widespread eggshell thinning and reproductive failure in birds - resulting in population declines of Brown Pelicans, Peregrine Falcons, and other species.